Released quite recently (2007), this is a collection of 15 of Asher's best-loved spiritually themed ballads from his back catalogue, entirely re-recorded more acoustically, using piano, cello, double-bass, classical guitar, recorder and vocals. With this simplified approach emphasising the poignant beauty of the melodies and lyrics, additional strings and choir sounds plus the ethereal accompanying female vocals of Hungarian gypsy singer Lila Mayi, make for a spine-tingling production. Normally when one thinks of new age music, visions abound of ambient synthesizers, chirping birds, nature scenes, and an album of vocal-less songs emerges. Then there is veteran singer-songwriter and new age artist, Asher Quinn, who defies this vision. 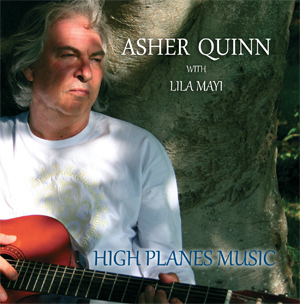 Mr. Quinn’s 2007 album, High Planes Music, is a compilation and re-recording of some of his most beloved new age ballads, distilled through the musical lens of cello, double-bass, piano, acoustic guitar and the unforgettable soprano vocals of Hungarian female singer, Lila Mayi. The songs throughout High Planes Music are colored by the gorgeous backing vocals of Lila Mayi. They complement each of the songs and do not stand in the way of Asher’s golden bass pipes. 'Goldenheart' is a great example of how Lila’s voice sits in the heavens while Asher sings; they add just the right dosage of sugary sweetness to the chorus and chime in periodically adding ornamentations to the already soothing voice of Asher Quinn. The heavenly arrangement and warm vocals create a cottony soft atmosphere for some relaxing music; not so much ear candy as they are silky ear pillows. The personal intensity of Asher’s lyrics is equally magnified by his ebullient voice. Lead track 'Fiery Moon' is a spiritual love song fuelled by a somnambulant cello. The singer makes a prayer-like plea to his lover: "My beloved, / I can feel you inside / Like a fireburst of flowers swaying… / My beloved…/ My beloved…/ Swaying to the moon / To the fiery moon"
Like many new age songs, celestial and spiritual themes are threaded throughout Asher’s art. 'Angel’s Lullaby' and 'Missa Greca,' the most breathtaking track on the album, blend optimism and religious spirituality into graceful anthems. 'Missa Greca' (which means Greek mass) slowly builds from the singular chant of Asher’s voice, into a wheel of recursive chants accompanied by Lila’s heavenly soprano. Shortly after a rhythmic bass kicks in, a series of booming drums rounds out a gloriously spiritual collage of hypnotic chants; the song shines out from the others on the compilation because of its unavoidable beauty and intensity. The deep and personal aspect of Asher’s persona is most evident on his coffee bar-like love songs 'This Love,' 'Life Is Only For Love' and 'Gypsy Madonna.' His vocals are disarming, as if he is singing to YOU: that one and only listener with no one else in the room. 'Life Is Only For Love,' another deeply personal song, is a mid-tempo ditty about love, life and the precious moments that must be savored, because they may be gone in an instant. 'To My One True Love'’s breathy bass vocal is soothing with crystal clear diction. Asher’s delicate intensity and flawless tone channel hints of Cat Stevens and Al Stewart. Poetry and storytelling are also cornerstones of his craft. Open Secret's harp strings build musical fences around his lucid storytelling. The blending of rhythmic words filled with themes of love and nature, along with his soothing vibrato create a mystical musical fortress. 'Flying Away' is a dream of lovers escaping away from reality: "Up in the sky / Cornflower blue / Wild starry night / Flying with you…" Underneath all of the allusions of love and spirituality is a message of the singer’s faith. This is most prominent in album-closer 'Promised Land,' an ode to Israel, the Jewish homeland. The song’s bells and slowly marching rhythm is lead by a solemn cello and sudden bursts of rejoicing. It is simultaneously uplifting and grounding because of its truth and beauty. Fans of Asher’s previous work will revel in this compilation of his best ballads re-recorded in an 'unplugged' format. For the uninitiated who are intrigued by the notion of mixing deeply personal folk and love songs (in the same vein as Bob Dylan) with new age atmospherics should seriously consider this record for their collection. Dear Asher, Fiery moon was playing in a New Age gift shop in Hastings old town, and my wife said to me 'have you heard that beautiful music?' and so we bought the cassette. That was back in 1993, the collection grew, and the rest as they say is history! Now we have ordered High Planes Music!